I never expected the National Trust to be a source of marital advice, but today I learned a useful, if possibly expensive, way to assure harmony with your spouse. You'll notice that I put my drowned rat of a sister into each picture to prove that these are indeed two sides of the same house. Sadly, it seems like the compromise on the house build didn't do much for Bernie and Ann's marriage: once the house was finished, she left him and headed to Bath. I learned all of this from Dorothy, the very excellent tour guide, who also revealed that Bernard and Ann had actually hated each other on sight. They had to be cajoled into marriage on account of him having the estate and her having the money. They had eight children though, so presumably they did meet up occasionally. The original house is actually a tower, built in 1590 to provide protection during troubled times. It was cramped but the Ward family was only relatively prosperous at the time. John Betjeman apparently said that being in the Boudoir was like living under the udders of a giant cow. I think we can see what he meant. 3. Attempted fratricide at Castle Ward! Bernard and Ann had three sons. The eldest, Nicholas, was eventually certified insane. His brother Edward apparently looked after him, but when Edward died in 1812 the other brother, Robert, tried to kill Nicholas. It sounds like he chose his methods from the Laurel and Hardy book of murder techniques - he tried loosening the stair bannisters so Nicholas would fall through them, which failed, as well as removing a cover from a coal chute so he'd fall down it. Robert was an all-round rotter, as he also plundered the house of its valuable contents, carting them all off to his own home. 4. A mystery about a missing village! The guide book explains how the widow of the 3rd Viscount may have paid for an entire village to board a ship and start a new life in America, allowing her to knock down their houses and take possession of the land. Nobody knows if it is true but the village of Audleystown did disappear completely. The wife of the 5th Viscount was a very intelligent woman - she was hugely respected in scientific circles for her use of the microscope. However, she is probably most famous for being killed by a steam engine built by her cousin - she fell under its wheels and was crushed in 1869. I haven't watched one single minute of Game of Thrones, so this was all a bit lost on me, but the farmyard at Castle Ward was used as the location for Winterfell! Now. You know on TV when they say "this next report contains scenes that some viewers may find upsetting"? Well, this part of my post comes with a warning that you might find the next picture a little...odd. It's basically five glass cases depicting the stages of a boxing match between two red squirrels. 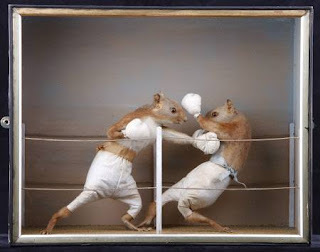 Yes, for 150 years these ten squirrels have been frozen in a tableau where they're either shaking hands or being punched in the face by another squirrel. I borrowed this close-up from Castle Ward's Facebook page as I wanted to show you the detail involved - it's unbelievable. They were created by a taxidermist called Edward Hart - he made several copies and one of them recently sold for $70,000. I had to be physically dragged from the room - I could have stood there all day boggling at the expressions on their little faces. But into the scone. The Castle Ward tea-room is one of the nicest that I've encountered - the seats were really comfortable and we were very happy to sit in there out of the rain drinking our tea. 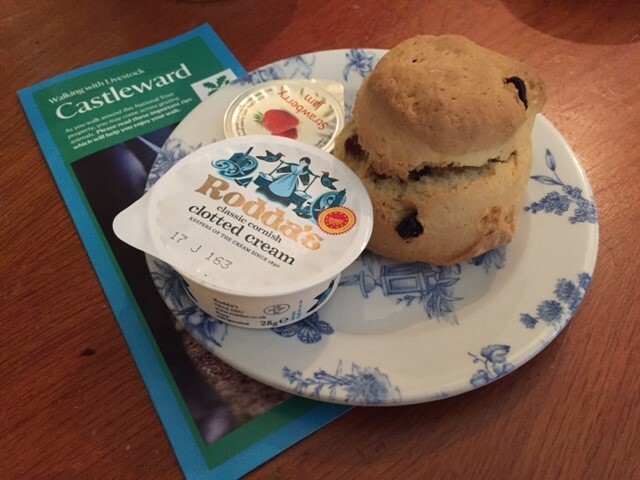 The scone itself was very tasty - maybe just a little bit on the dry side but definitely fresh. Castle Ward is one of those NT properties that you just have to visit - amazing architecture, fantastic history, and a bit of Game of Thrones thrown in if you're that way inclined.